Water storage would help farmers more than bullet trains bisecting their orchards. This sign in California’s Central Valley suggests that farmers in the region think their state has its priorities wrong. Nature and politics have left their operations thirsting for water while California is spending billions of dollars on high-speed rail. If and when the rail project is completed — the planners are shooting for 2029 — bullets trains will carry passengers between San Francisco and Los Angeles in three hours or less. They’ll be going close to 200 miles an hour, too fast to see much of the parched former orchards and fields. 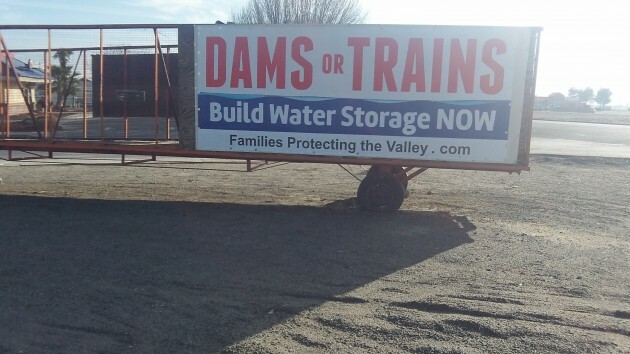 A story in the Los Angeles Times makes readers understand why farmers in the Central Valley might feel that the train project is siphoning up money they could be better spent on solving their water problems. The paper reported that the board of the California High Speed Rail Authority had just approved a “prospective contract” for the construction of 22 miles of rail structures in the Central Valley — for $348 million. But the paper said relocating utility lines and underground pipes along that segment would cost an additional $101 million. Overall, according to the story, the Central Valley segment of the rail line is estimated to cost some $6 billion. Work has started in the Central Valley because, the authority says on its website, part of the money was approved as part of the federal stimulus program and has to be spent by 2017, and as difficult as building the rail line is there, it would take much longer to get started in near San Francisco or Los Angeles. Given the costs and complications — including separating grade crossings and building new bridges and tunnels — it’s easy to understand why Oregon’s high-speed rail planners have decided that following the existing Union Pacific route is the best avenue for improving passenger rail service between Eugene and Portland.